LAHORE: Czech model Tereza Hluskova challenged her conviction by the Lahore High Court (LHC) on Tuesday after being found guilty of narcotics smuggling. The petition asked for the sentence to be set aside as it was based on false accusations. In the petition, the model said that she had come to Pakistan for Islamic studies. On March 20, a lower court in Lahore announced the detailed verdict and sentenced the Czech model to eight years and eight months in prison. She was also fined over Rs1.4 million. During the hearing last month, Additional Sessions Judge Shehzad Raza pronounced her guilty and handed her an eight year and eight months prison term. The hearing was also attended by the deputy secretary of the Czech embassy. The court in its verdict had said the prosecution had been successful in confirming Hluskova was guilty of smuggling heroin and that she had failed to prove her innocence.The value of the drugs in the international market was believed to be Rs150 million. The appeal against the sentence filed through a counsel states that the trial court handed down the conviction beyond merits of the case and without any concrete evidence against the appellant. It pleads that the trial court solely relied upon the concocted story of the prosecution and ignored the facts of the case. The appellant asked the high court to set aside the conviction and acquit her of the charges. As per the prosecution, the 21-year-old Czech model was trying to smuggle the 8.5 kg heroin from Lahore to Abu Dhabi on Jan 10, 2018 but intercepted by customs officials. The prosecution presented nine witnesses against the suspects. The trial court had acquitted co-suspect Shoaib Hafeez Khan for lack of evidence and declared three other co-suspects proclaimed offenders. 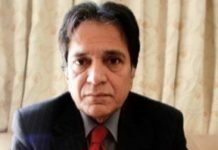 Previous articleWhy Jawad Ahmad barred from speaking at Faisalabad conference!